I'm super excited to announce I'm hosting my very first giveaway!! My birthday is next Wednesday, the 16th, so I wanted to share the love and have a giveaway to show how thankful I am for you guys! I've gathered a bunch of cute little things, but I plan on adding more to the box before it ships out, so there will be a few little surprises in there too! You can get extra entries! Ok folks, that's a total of THREE possible entries! 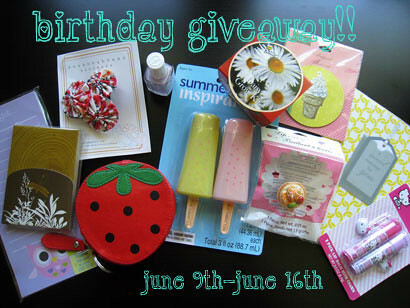 The giveaway ends on my birthday at 5pm CST on June 16th (my birthday!). I'll announce the winner shortly after that. I definitely want to enter this giveaway! my favorite drink is water, boring I know. but I do enjoy the occasional strawberry milkshake now and again! Happy Birthday. My favorite drink is cherry coke or earl gray tea. They're both pretty awesome. aw susannah! this giveaway is almost as cute as you! so excited! and happy happy birthday (a week early!) i wish we could celebrate together! OMG This stuff is so cute! My birthday is the 14th! Yay!! Happy Birthday! I love 100% Organic Purple Grape Juice in cute hello kitty cups! Happy Birthday! Your giveaway is super exciting!! My favorite drink -green smoothies!! this is super cute! happy early birthday!!! happy (early) birthday! such a cute giveaway :) my fav drink is green tea! Anyway, my favorite drink is CHOCOLATE MILK. I have a super love obsession with it. Also chai tea lattes. Yummm. My favorite drink is Dr. Pepper. I have tried to give it up, but I just can't. I am all about a spicy bloody mary these days! My fave drink is a dirty martini with blue cheese stuffed olives, yum! I already follow you, and as for my favorite drink, well, I usually only drink water, but I like lemonade, especially pink lemonade, especially in the summer :] Happy early birthday and thanks for a cute giveaway! My favorite drink is definitely a pina colada. My favourite drink it unfortunately pretty boring. I like a nice cold glass of water with a packet of Raspberry Ice Crystal lite! i just wanted to say hi, i´m a new reader of your lovely blog. (your giveaway is pretty sweet, by the way! and i´d LOVE to win. )i hope your birthday is gonna be an amazing day with lots of surprises and sunshine! enjoy it! super cute giveaway! my favourite drink is water. when i'm not being boring my favourite drink is chocolate soy milk! Omg I love, love, love the items in this giveaway! Anyhow, my favorite drink would happen to be Red Robin's Freckled Lemonade. We share the same birthday!!!! I want the yoyo headband! Here is my blog post link! I blogged it... sorry it took so long.